The U.S. Department of Energy’s (DOE) new report on the U.S. electric grid makes valuable recommendations for expanding access to reliable, low-cost electricity by streamlining approval of electric transmission infrastructure and using markets to procure essential reliability services. As a low-cost source of energy that can provide reliability services as well as or better than conventional power plants, wind energy will flourish with the expansion of markets and infrastructure. We welcome the Department of Energy report’s focus on resilience and strongly support the recommendation to value essential reliability services, as wind energy is making critical contributions to a more reliable and resilient power system. 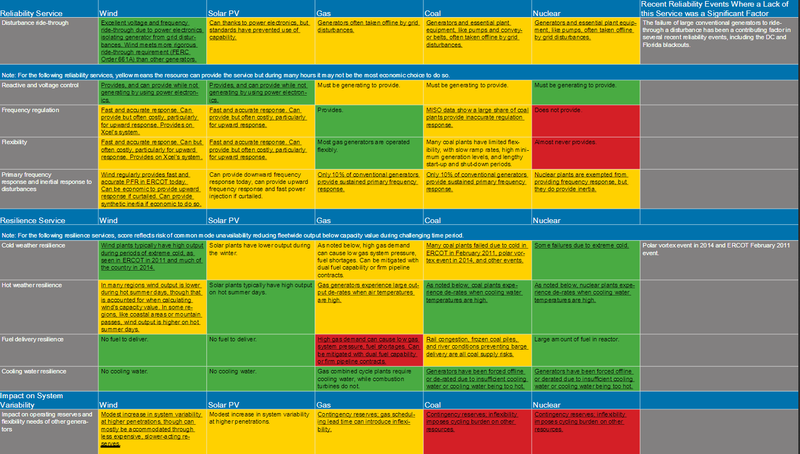 The following table documents the reliability and resilience services provided by different energy sources, demonstrating that renewables perform well on most if not all metrics. The fact that no resource excels at providing all services demonstrates the value of a diverse power system, as well as the importance of essential reliability services markets for sorting out which resources can most cost-effectively provide those services at any point in time. NERC (the North American Electric Reliability Corporation, the entity responsible for electric reliability), confirms that “wind energy… offers ride-through capabilities and other essential reliability services.” For example, sophisticated power electronics allow modern wind turbines to exceed the ability of conventional power plants to ride through grid disturbances, improving system resilience. As we’ve explained, those power electronics and output controls also allow wind and solar plants to provide voltage and reactive power control and dispatchable flexibility for regulating power system frequency. The DOE report notes that “manufacturers have designed electronic controls for newer model wind turbines that can provide automatic generation control, primary frequency response and synthetic inertia” (page 73). Grid operators in Texas and Colorado regularly dispatch wind plants to regulate power system frequency, and most wholesale electricity markets dispatch wind generators under the same market rules as other power plants. 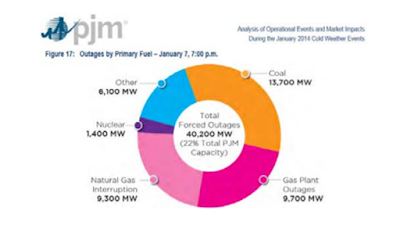 In contrast, many coal and nuclear power plants are not dispatchable and do not help regulate power system frequency. NERC recently noted that power system frequency response is noticeably higher when wind output is high in Texas. AWEA has long supported market-based compensation for those services and technology-neutral reliability standards, so we strongly support DOE’s call for "creating fuel-neutral markets … that compensate grid participants for services that are necessary to support reliable grid operations" (page 126). Markets for grid reliability services, called ancillary services markets, are the most efficient way to procure these needed services. Wind and solar will continue to increase their participation in such markets, particularly as technologies like smart inverters and fast controls expand the reliability services they can cost-effectively provide. DOE’s study cites another recent DOE report that lists the four main needs for the reliable operation of the power system (page 67-68). As that report explains, renewable resources make valuable contributions to providing all of those services. As illustrated in the table above, many resources, including wind and solar plants, are capable of providing those services. 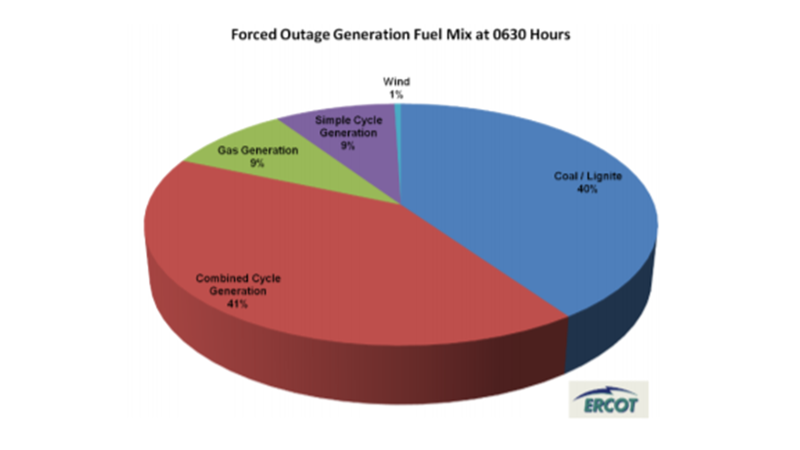 Wind plants will not always be the most economic resource to provide all of those services, just as coal and nuclear plants do not typically provide flexibility or other reliability services. That’s fine; in fact, that’s the beauty of markets. Markets find which resource can provide a service at the lowest cost at that moment, and use a division of labor across a diverse energy mix to keep the lights on. The DOE report identifies infrastructure development as a key solution. Among the report’s primary recommendations are that “DOE and related Federal agencies should accelerate and reduce costs for the licensing, relicensing, and permitting of grid infrastructure,” and that “DOE should review regulatory burdens for siting and permitting for generation and gas and electricity transmission infrastructure and should take actions to accelerate the process and reduce costs” (page 127). Transmission benefits all low-cost generation resources as it allows their low-cost power to reach customers, much like the interstate highway system allowed the most efficient producers and retailers to get their low-cost products to market. For example, the Quad Cities nuclear plant on the border between Illinois and Iowa is facing economic challenges because power prices there are $8/MWh lower on average than those just 100 miles to the east in Chicago. 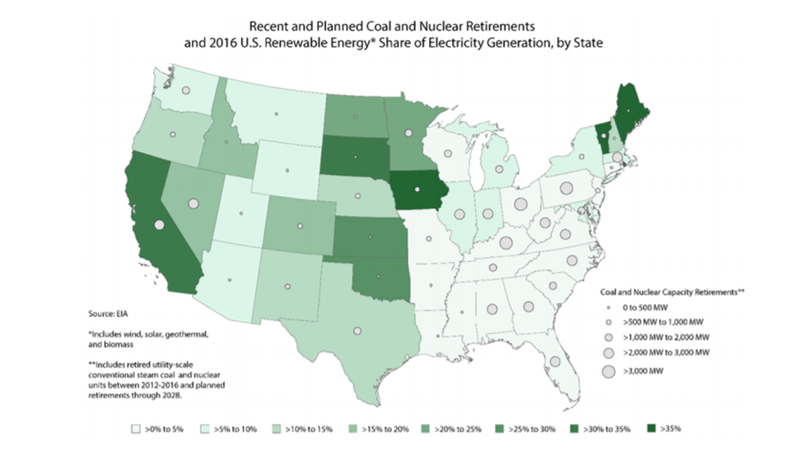 Upgrading the grid to allow more power to be delivered from Quad Cities to Chicago would be a win-win for both the nuclear plant and consumers in Chicago. Grid operators and other experts have explained that transmission is a key solution for making electricity more reliable and affordable. The benefits to consumers are even greater when transmission helps access low-cost, stably-priced clean energy resources, as Texas has successfully demonstrated with its Competitive Renewable Energy Zone power line projects in West Texas. As DOE’s report documents, “Transmission investments provide an array of benefits that include providing reliable electricity service to customers, relieving congestion, facilitating robust wholesale market competition, enabling a diverse and changing energy portfolio, and mitigating damage and limiting customer outages (resilience) during adverse conditions. Well-planned transmission investments also reduce total costs. SPP analyzed the costs and benefits of transmission projects from 2012–2014 and found that the planned $3.4 billion investment in transmission was expected to reduce customer cost by $12 billion. This yielded an estimated benefit of $3.50 for every dollar invested in the region. A robust transmission system is needed to provide the flexibility that will enable the modern electric system to operate. Although much transmission has been built to enhance reliability and meet customer needs, continued investment and development will be needed to provide that flexibility” (page 75). DOE accurately diagnoses the constraints limiting transmission development and identifies the solutions: “The challenge for building transmission continues to revolve around the three traditional steps involved, each of which can be time-consuming, involved, and complex: (1) demonstrating a need for the transmission project, also known as transmission planning, (2) determining who pays for the transmission project, also called cost allocation, and (3) state and Federal agency siting and permitting. FERC has taken steps to help with the first two, with reforms such as Order No. 1000, which remains a work in progress.” (75) DOE also explains that “natural gas pipelines can be built more quickly than electric transmission lines (in most states) because they have a comparatively streamlined permitting process” (page 37). A more robust transmission system would prevent almost all occurrences of negative prices, whether caused by nuclear, coal, or renewables. 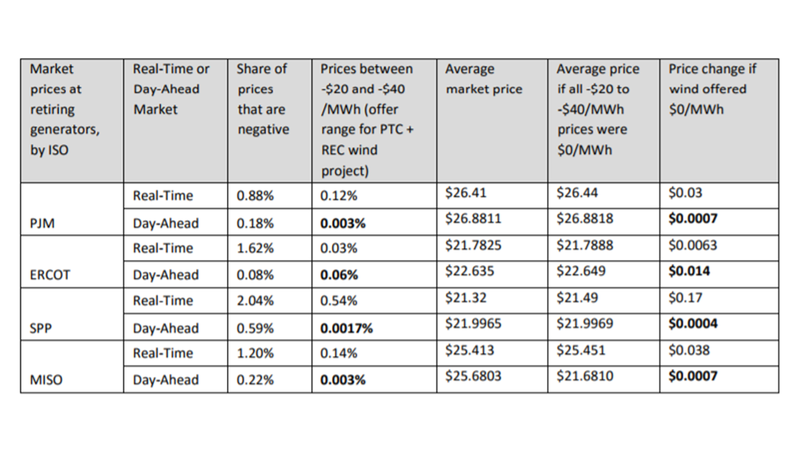 The DOE report accurately notes that most instances of negative pricing have been observed at “constrained hubs that feature a relatively large amount of VRE and/or nuclear generation” (page 114). 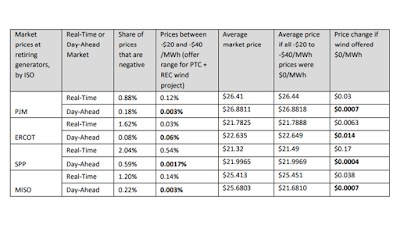 As explained previously, any instances of wind-related negative prices are typically caused by transmission constraints on isolated parts of the grid. Because there are few if any conventional power plants on these remote parts of the grid, these events have little to no impact on other generators. DOE and NERC both note that reliability is continuing to increase across a range of metrics, with DOE explaining that “All regions have reserve margins above resource adequacy targets” (page 66), and that “BPS reliability is adequate today despite the retirement of 11 percent of the generating capacity available in 2002, as significant additions from natural gas, wind, and solar have come online since then” (page 63). 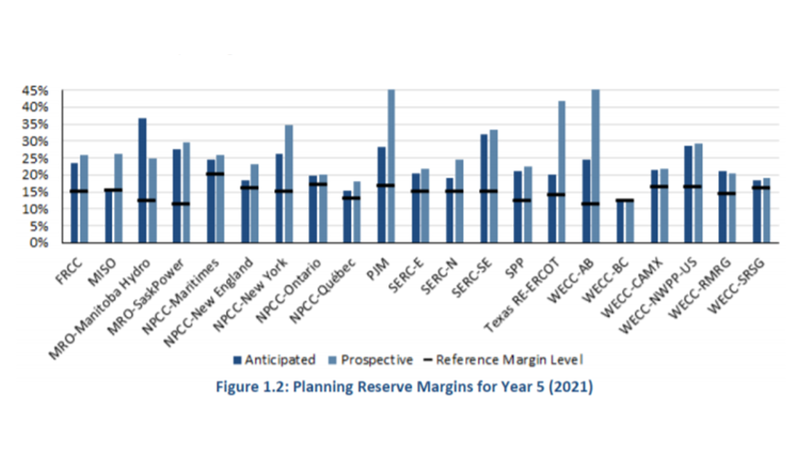 The chart below, compiled from grid operator data and included in NERC’s Long-Term Reliability Assessment, confirms that all regions greatly exceed their targeted level of reserve power plant capacity through at least 2021. 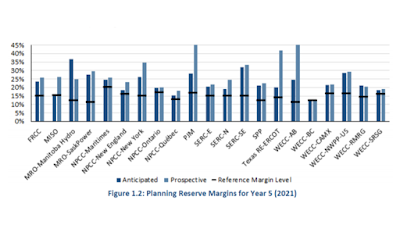 Moreover, the regions experiencing the most coal plant retirements, PJM and SERC, exceed their capacity reserve margins by double digits even under the most conservative planning standard.